Resin bound paving uses a high grade, castor oil-modified epoxy resin to bind aggregate (stone). Because the bond forms at the point of contact between the aggregate, voids occur. These voids allow water to get away into the ground. Once cured the resin remains inert, so will not directly affect the soil. As well as a permeable surface the resin also offers flexibility, toughness and a uniform finish. A resin bound overlay to an existing driveway is quick and easy to construct and depending on size can be completed within a day. For new driveway builds a resin bound system like its alternatives may require comprehensive groundwork. This is important to avoid sinking, splitting, or cracking and to establish a stable substrate, correct filtration and the introduction of a free draining road base. Laid right a resin bound porous surface will remain flexible and crack resistant for years to come. Initially a resin bound driveway has a glossy finish this will eventually weather to a more natural looking state. If a wet look is desired a top coating can be applied. The proven durability and performance of resin bound driveways make them as attractive to environmentally aware homeowners as they are to those seeking a blue ribbon look. Resin bound paving should not be confused with resin bonded surfaces. Resin bonded paving is constructed with a thin coat of resin applied to a surface with aggregate scattered on top. It is non-porous and on driveways will loosen over time. A resin bound system is much stronger. For driveways it requires a minimum surface depth of 25mm using 6mm aggregate, where every stone is mixed thoroughly with a clear resin that is then hand-trowelled to finish. A resin bound driveway will remain stable, permeable and keep its looks. Currently in New Zealand, resin bound driveways have a ten-year guarantee. From a practical point of view, as weather bombs and flash floods become a reality it pays to think about how water disperses from your property. Many impervious driveways simply allow water to surge over the surface and straight into the storm water system, taking with it debris and any oil and pesticides that may be present. Water pooling too causes issues with mildew and grime build up, while poor drainage can lead to erosion. A porous resin bound driveway deals with driveway run-off in an environmentally benign way. Instead of surface water simply streaming into storm water channels the voids within a resin bound surface allows water to percolate into the earth, the way nature intended. A resin-bound aggregate finish requires little maintenance. It can be cleaned with a light detergent and brush while for larger areas, an annual spruce up with a low-pressure water blaster is recommended. From the decorative angle resin bound driveways offer a host of creative options. StoneSetnz currently provide 12 UV resistant coloured gravel options and is developing more. 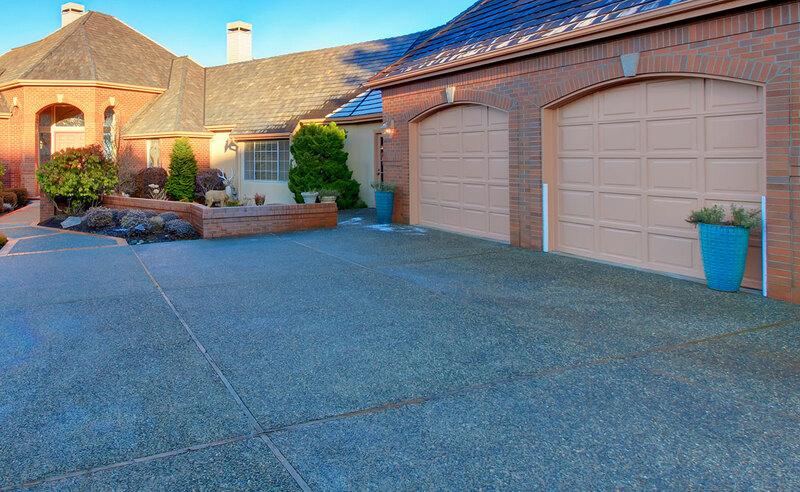 Permeable driveway surfaces are only suited for slopes with a gradient less than 30°. Should be installed by approved specialists. A resin-bound surface can be damaged by the dragging of heavy skip bins or similar and, voids can become plugged under deposits of soil and mulch. If the latter cannot be avoided then clean thoroughly as soon as possible. Resin bound driveways are not completely weed resistant as wind borne spores can gather in the voids. Cost wise, resin bound driveways sit at the upper end but for performance and durability you get what you pay for. Permeation rates alone are very high, around 60 litres/m2/second. All driveways meet maximum slip resistance standards, with appropriate aggregates available for steeper slopes. Currently resin bound paving has a 10 year NZ guarantee but has an expected working life in excess of 25 years. An overlay driveway starts from $180 per square metre. For a complete porous paving system on a new driveway prices begin at around $350 per square metre which includes the construction of a substrate that not only provides stability it acts as a kind of water filtering system, Typically this would include geotextile membrane, perforated pipe to stormwater, 150mm of compacted permeable road base, topped with a layer of 50 mm deep recycled plastic gravel/drainage cell, back filled with 6 mm recycled aggregate. The visible top course -in your choice of colour- is set at a minimum depth of 25mm. Explore other material options to create a driveway here: Concrete driveways and Asphalt driveways.